Millennium was stolen last week from his home at the Alley Pond Environmental Center. 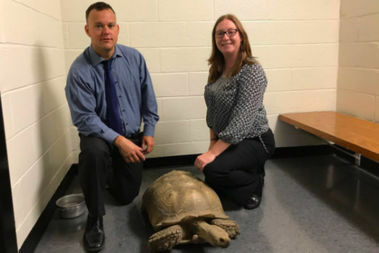 DOUGLASTON — The rare, 100-pound tortoise brazenly taken from its home at an animal center was found Monday in Connecticut, police said. Millennium — who could be as old as 100 years — was taken from his home at the Alley Pond Environmental Center at 228-06 Northern Blvd. on either July 16 or July 17, officials said. A person who purchased the tortoise called the NYPD after realizing it could be the missing animal, police said. It's not clear where or how Millennium was sold. Millennium, who could be anywhere from 17 to 100 years old, returned to Queens Tuesday afternoon and enjoyed a treat of fresh lettuce and carrots with his friend and roommate, Mini Me. He then took a stroll around the animal facility, which is home to many other rescues. Police are still investigating the theft, officials said.